second hand grand pianos | Are You Looking For A Piano? Do You Want To See & Play Lots of Different Pianos All Under One Roof? Are You Looking For A Piano? Do You Want To See & Play Lots of Different Pianos All Under One Roof? Selling or Exchanging your Piano? This almost new Kawai RX series grand piano is a beautiful instrument. 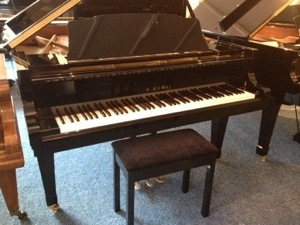 A real musicians piano, in excellent condition and amazing value for money. Compare the RX3 against new and second hand Yamaha rival models. You won’t be disappointed!. Are You Looking For A Piano? The Piano Gallery are one of the UK's largest Piano dealers stocking over 100 new and used upright & grand pianos. Our beginner pianos start from as little as £495, and our professional level instruments can go up into the thousands. Our Upgrade option means that if at any time in the future you wish to Upgrade a piano bought from us, we will give you YOUR MONEY BACK (less the VAT) against another piano!